An Israeli appeal court has extended the sentence of a mentally-ill Palestinian teenager, Ahmad Dawuod Obeid, to one year in prison on charges of throwing stones at Israeli forces, Press TV reports. The Jerusalem Magistrates Court extended the house arrest of the 19-year-old teenager arrested by Israeli forces back in August in Issawiya, near Jerusalem al-Quds, and put under house arrest on charges of throwing stones at Israeli forces. Obeid, who is profoundly deaf, has to continue his house arrest until March 2014 when he will be given another hearing. Aouda Zbeidat, Obeid’s lawyer from Addameer prisoners’ group, accused the Israeli court of corruption and breaking international humanitarian law. “As his lawyer, I tell you that it is illegal to judge him without due process of a person with a mental illness. He should have had a specialist investigator who deals with mentally ill people in a suitable manner,” Zbeidat told Press TV. “They are also obliged to take him to hospital for full medical check and report. They followed none of these and used his confession under interrogation as proof in the court,” she added. Ahmad’s family say they’re deeply concerned about his health condition which they say is deteriorating each day. “We prevent him from leaving the house in order not to be re-arrested. He has become neurotic, he does not eat,” Obeid’s father said. “He does not know what a police officer, a court, or house arrest are. These terms are above his mental capacity,” he added. RAMALLAH (Ma’an) – Twenty-six veteran Palestinian prisoners will be released after midnight at Ofer detention center near Beitunia in the West Bank and at Erez crossing in the northern Gaza Strip simultaneously, an official said Monday. Undersecretary of the Palestinian ministry of prisoners affairs Ziad Abu Ein said he and minister Issa Qaraqe along with others will enter Ofer detention center at 11 p.m. to receive the West Bank prisoners. They prisoners will then travel in Palestinian buses to the presidential compound in Ramallah for an official and public reception. Buses will be waiting at Ofer detention center at 6 p.m. A special ambulance will also be waiting to transfer sick prisoner Naim Shawamrah from Hebron. President Mahmoud Abbas and his prime minister Rami Hamdallah will welcome the prisoners in front of the tomb of late Palestinian president Yasser Arafat. The president and freed prisoners will light a torch commemorating the 49th anniversary of the Palestinian revolution. Prisoners will then leave to their hometowns for local and family celebrations. BETHLEHEM (Ma’an) – The Palestinian community in Italy in cooperation with the Union of Palestinian Women announced Monday a fundraising campaign to support the people of Gaza. The campaign “Blanket for Gaza” was announced in a news conference at offices of the embassy of Palestine in Rome. She highlighted that a winter storm which hit Palestine recently caused huge damage in the Gaza Strip adding more suffering to children, women and elderly people. The goal of the fundraiser is to collect money to buy blankets and sheets to be shipped to the Gaza Strip to help residents during winter. GAZA CITY (Ma’an) – The mayor of Gaza City Rafiq Makky on Monday submitted his resignation to the Hamas-run government’s minister of local governance. Makky told Ma’an that it was the second time he submitted his resignation. The first time, he explained, was three months ago, but it was turned down. In both cases, the decision to resign was due to “personal and health-related” reasons, he added. The mayor highlighted that he was asked to stay in office until an “appropriate replacement” is found. Prisoners from Gaza and East Jerusalem already release, West Bank residents to be transferred after midnight; bereaved families march through Jerusalem to rally at freed prisoner’s home. Relatives of Ramadan Yaqoub, one of 26 Palestinian prisoners expected to be released Monday night, at the family home in the Qalandia,refugee camp on the outskirts of Ramallah. Israeli bereaved families march through Jerusalem in protest as Israel prepares to free 26 Palestinians jailed before the signing of the 1993 Oslo Accords on December 30, 2013. Israel began releasing Monday night 26 Palestinian prisoners jailed before the Oslo Accords, after the High Court of Justice rejected a petition by bereaved families to halt the move. This is the third group of prisoners released since the peace negotiations with the Palestinians began last July. Eight of the released prisoners, residents of the Gaza Strip and East Jerusalem, began making their way home at around 10 P.M. The remaining 18 will be transferred after midnight from the Ofer Prison to Bitounai Checkpoint, near Ramallah. Prior to the release, dozens of bereaved families marched through pouring rain on Monday evening from Prime Minister Benjamin Netanyahu’s residence in Jerusalem to the Old City to protest. The Jerusalem Police and the families reached a compromise earlier in the evening, according to which 15 protesters alone were allowed to continue from the Western Wall to the home of one the release prisoners to stage a rally. A number of protesters joined the 15, without permission, forcing police to intervene to disperse the unauthorized demonstrators. Prior to reaching the prisoner’s home, the protesters held signs declaring “Jewish blood will not be forsaken,” “we will not give up,” and “an ethical shame.” Some 20 extreme right-wing activists joined the protesters at the entrance to the Old City, holding signs proclaiming “death to terrorists.” A number of streets in the city were closed off due to the march, which took place in relative quiet. Responding to the publication of the list of prisoners to be released, officials of the Palestinian Prisoner Society said on Sunday that the number of veteran prisoners in Israel is 107 and not 104 as stated by Israel. The society also demanded that 32 prisoners be included in the fourth round of prisoner releases, which is due to take place in April. Comparing the Palestinian Authority and Israeli lists, it seems that there are three more prisoners than originally listed. One is Naim Shumri, who was arrested in 1995 and is considered to be seriously ill, prompting the PA to request his release without connection to the talks. The other two are Said Alarabli from Gaza, who was arrested in July 1994, and Said H’tatba of Nablus, who was arrested in September 1994. Shumri is due to be released on Monday, but the society called on PA President Mahmoud Abbas to add the three prisoners to the Palestinian list, so that the Alaragli and H’tatba would be released in the next round. As in the two previous stages, the West Bank prisoners will be brought to the Bitounia checkpoint near Ramallah, while the three prisoners from Gaza will be delivered to the Erez Crossing. The West Bank prisoners will attend a ceremony with Abbas at the government compound in Ramallah before returning to their homes. The Gaza prisoners are also expected to attend celebrations at Beit Hanun, in the northernGaza Strip. The Palestinian Prisoner Society maintains that the first round of releases included Burhan Sabih, who wasn’t on the Palestinian list since he was arrested in 2001, when he served as an officer at the Preventive Security Force. Therefore, a total of 107 prisoners should be released. The issue is expected to be raised in the talks Abbas will hold with U.S. Secretary of State John Kerry in Ramallah on the weekend. According to Palestinian records, there will still be 32 veteran prisoners in Israeli jails after the current round of releases. Of those, 17 are from the West Bank and Gaza Strip, 14 are Israeli citizens and one is a Jerusalem resident. Of the Israeli citizens, the most prominent are Karim and Maher Yunis, both of whom are beginning their 31st year in prison and are considered the longest serving Palestinian prisoners. The two, residents of Kfar Ara, were convicted of the murder of the soldier Avraham Brumberg in 1980. Their uncle, Sammy Yunis, who was the oldest and longest-serving prisoner, was released in the Gilad Shalit deal. In July 2012, a parole committee recommended that their sentences be commuted to between 35 and 40 years. The list includes another five Israeli citizens arrested between 1986 and 1988. 2014: year of solidarity with Palestinians kicks off! The year 2014 has been proclaimed the International Year of Solidarity with the Palestinian People by the UN General Assembly. The General Assembly´s debate on the Middle East 26 November. UNRIC : In a vote, 26 November, the text was adopted by 110 votes in favor to 7 against (Australia, Canada, Micronesia, Israel, Marshall Islands, Palau and the United States), with 56 abstentions. The resolution requested the Committee on the Exercise of the Inalienable Rights of the Palestinian People to organize activities around that observance, in cooperation with Governments, the United Nations system, intergovernmental organizations and civil society. The General Assembly voted on a number of resolutions on related issues such as the convening of an international conference in Moscow, as well as a resolution stating that all legal and administrative measures taken by Israel to change the legal status of East Jerusalem were null and void. It also called for Israel to withdraw from the Golan heights to 1967 borders. The representative of Iran, said in the debate that Israel had committed heinous crimes against Palestinians, including construction of illegal settlements and an apartheid wall, and the Gaza blockade. The Israeli regime, as a source of terrorism, continued to perpetrate its crimes with a sense of impunity. Speaking after the votes, the representative of the United States said that his country remained deeply troubled by the repetitive and disproportionate number of one-sided Assembly resolutions condemning Israel. Only four other resolutions had been critical of other Member States. All parties to the tragic conflict had a responsibility for ending it, and the United States was disappointed that the Assembly continued to single out Israel. “We cannot afford to lose the current moment of opportunity,” UN Secretary-General Ban Ki-moon said in a message read on his behalf. “The goal remains clear – an end to the occupation that started in 1967 and the creation of a sovereign, independent, and viable State of Palestine based on the 1967 borders, living side by side in peace with a secure State of Israel,” he said. London’s show of solidarity — Replica of the Israeli Separation Wall Built in Central London on 23rd of December 2013. (London) St. James’ Church in central London unveiled an eight-meter-high replica of the Israeli-built concrete wall that entirely surrounds the Palestinian city of Bethlehem in the occupied West Bank, the traditional birthplace of Jesus. Bethlehem Unwrapped: festival opened with the unveiling of a 8m high life size replica of the separation wall that has been built by Israel in the West Bank. It has been constructed over 8 days in the church yard of St James’ near Piccadilly Circus in central London in a bid to bring some reality of what it is like to live in Bethlehem in 2013. “This Christmas we have built a huge wall across the front of our church. We’d really like you to come and see it because it’s what the people of Bethlehem are experiencing today,” explains Reverend Lucy Winkett, rector of the church, in the brief video below. The wall is part of the “Bethlehem Unwrapped” festival, which features a week of events, starting on 29 December, including music by Reem Kelani and Nigel Kennedy, stand up comedy with Jeremy Hardy and Mark Steel, as well as films and panel discussions. Visit The Wall At St James’s Piccadilly and make your mark on the wall, watch what you say, watch out for the pinkies, the infiltrators, sayanims, anti-Zionist pretenders, who will be looking to control the agenda and tag a few radicals, tell them politely, but firmly to “take a hike, we know the game now.” Beat them at their game if you can. • There are now five billboards throughout the Atlanta area depicting Mary and Joseph being blocked from Bethlehem by the Israeli apartheid-annexation wall. These electronic billboards will be up for two weeks and will be seen an estimated 4 million times. (We have also created a special section on our website with information supporting this billboard). • Supporters are placing versions of our advertisements in 15 newspapers around the San Francisco Bay Area. These ads inform readers about aid to Israel and direct readers to the Stop the Blank Check website for more information. In 2013 CNI (COUNCIL FOR THE NATIONAL INTEREST, Washington DC) paid for ten billboard advertisements in Atlanta, Georgia and six more nationwide protesting United States government’s “blank check” funding for Israel. Many of the most serious dangers facing Americans today stem from our highly unusual relationship with Israel, says Ms. Weir. Our uniquely massive support for Israel has cost trillions of dollars and multitudes of lives. It has diminished our moral standing in the world, lessened our domestic freedoms, and exposed us to unnecessary and growing peril. The majority of Americans – as well as our diplomatic and military experts – oppose this unique relationship. If we are to have sensible, effective policies that promote safety rather than danger, then it is essential that all Americans become active and informed. Lives depend on it. America’s inability to resolve the question of Palestine is one of the gravest tragedies of our times. This is primarily because the US administration and the US Congress have succumbed to the demands of the Zionists, the Zionist regime and its various Lobbies, AIPAC (American–Israeli Policy Action Committee) and ADL (Anti-Defamation League). There exists a coordinating agency called “The Conference of Presidents of Major Jewish Organizations,” Their website (www.conferenceofpresidents.org/) is worth exploring (and AIPAC is just one of literally dozens of organizations under its umbrella). This is a lethal ailment that afflicts the United States. The American politicians have fallen captive to this Zionist network. Surely fair-minded Americans the likes of Ms. Alison Weir and her compatriots at the Council for the National Interest and If Americans Knew.Org, prefer US-inspired policies to those perpetrated by the Zionists. Regrettably, little is being done to cure this fatal disease. So, as long as this situation persists, we will see war and injustice in the region. The US government being the primary negotiator for peace and security between Zionists and Palestinians should bear the responsibility for the Israeli regime’s massacre of Palestinian women and children in their homes and territories. Peace and security will be realized only through the establishment of true justice. How can sustainable peace and security be reached by provoking and humiliating others? On Christmas Eve, while Christians knelt in churches to honour the birth of the eternal light of the Child of Bethlehem — the Child of peace, Israeli Herods struck Gaza and the life-light of little Hala haemorrhaged into eternal death, writesDr. Vacy Vlazna, Coordinator of Justice for Palestine Matters. Impunity aside, ultimately, they attack because they are depraved Untermenschen, not just the military but every Zionist who supports Israel’s illegal occupation, warmongering and apartheid policies. They attack because a three year old Palestinian child’s life, its delightful vitality, its laughter, its wonder, its tears, its fun and its fears means nothing to these inhuman thugs and nothing to the UN and nothing to the leaders and citizens of western democratic nations who look away from Israel’s war crimes and daily crimes against humanity. On Christmas Eve, the songs of Christmas angels were muted by explosions when Herods’ tanks and warplanes “forcefully” bombed Gaza for two hours hitting Hala’s home in Al-Maghazi refugee camp, massacring her innocence and injuring her mother Buthaina, and brothers Mohammed 6 and Bilal, 4. Little Hala should be alive now. It was her sacred right. Three Palestinian prisoners who were set to be released to Gaza Monday night have been transferred from Ofer Prison to the Erez border crossing while the five Arab-Israeli prisoners being released to East Jerusalem have been transferred to an unspecified location. All of the 26 prisoners were expected to be freed after midnight. Hours before the third group of Palestinian prisoners were to be released, dozens of people protested against the move at the entrance to Jerusalem under Police supervision amid fear the protest would turn violent and the roads to the city would be blocked. At the same time, terror victims families staged a protest march from Prime Minister Benjamin Netanyahu’s official residence in the neighborhood of Rehaviah to the home of one of the prisoners in East Jerusalem. The Israel Prison Service began processing the 26 Palestinian prisoners, all of whom were held in Israel for 20 years or more, on Monday morning, moving them to a facility where they were examined by the Red Cross. This is the third group of prisoners released within the framework of peace negotiations with the Palestinians. A fourth and final group is slated for release in April, bringing the total to 104. Most of the prisoners were convicted of murdering Israeli civilians, soldiers or Palestinians suspected of collaborating with Israel and. They served between 19 and 28 years of their life sentences. This is the first time that Arab-Israeli citizens, residents of East Jerusalem, are included among the prisoners. At the Ofer prison, located between Jerusalem and the Palestinian city of Ramallah, those slated for release were undergoing identification procedures, medical checks and examinations by the Red Cross. Most of them will then be handed over to Palestinian authorities in the West Bank, where preparations are under way to accord them a hero’s welcome. Three of the group will be transferred to the Gaza Strip, from where they hail. All the released inmates will receive tens of thousands of shekels in monetary compensation from the Palestinian Authority, which regards them as freedom fighters. Earlier on Monday two motions were filed with the Israeli High Court by the Almagor Terror Victims Association. One motion asked the court to allow the group to hold a protest march to the East Jerusalem home prisoner Ahmad Khaled. Police initially refused to give permission for the march but Ynet reported that the decision was seemingly reversed and the protest march will be allowed to commence. The other petition, also rejected by the court, criticized the planned release of five Palestinians residents of East Jerusalem, claiming it violated Netanyahu’s pledge that any release of Israeli citizens must be discussed separately by the government. The organization contended that Israel annexed the eastern part of Jerusalem after the 1967 Arab-Israeli war and its residents are thus de facto Israelis. Legal sources explained Sunday that there is a fundamental difference between the East Jerusalem residents and the rest of the citizens. “Upon release, the East Jerusalem prisoners will be subjected to a series of strict restrictions, including restrictions on their movement,” Walla! news site reported. “any violation of those restrictions will be met with a serious response. According to the release conditions the prisoners can be rearrested,” the sources added. In a press release Saturday night, the Prime Minister’s Office said all of the inmates had been convicted of offenses committed prior to the signing of the 1993 Israeli-Palestinian Oslo Accords. As the third group was about to be freed, a controversy emerged regarding the fourth group, scheduled for release in April. According to a report on Channel 2 news, US Secretary of State John Kerry had promised the Palestinians that Israel would release a group of Arab Israelis in the final batch of prisoners, despite Israel’s refusal to do so. 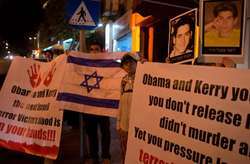 The report further said that Kerry has been trying to convince Israel to go ahead with the move, something the government has refused to do. Sources close to Prime Minister Benjamin Netanyahu however said that the premier would consider the release if the US agreed to free former intelligence analyst Jonathan Pollard who has been held in a US federal prison for 28 years following his conviction for spying on behalf of Israel. CAIRO — Egypt’s government has detained four journalists working for the Qatar-based Al Jazeera English news channel, arresting them during raids on a five-star hotel and at least one private residence Sunday night. The reporters, including one Australian national, are accused of “harming national security” through links to the recently banned Muslim Brotherhood organization, the Interior Ministry said in a statement. Egyptian police said the Al Jazeera English bureau — which had been broadcasting from a suite at the Marriott hotel following the closure of its Arabic-language sister channel during a military coup in July — was being used as a meeting point and press center for members of the Muslim Brotherhood. Egypt’s military-backed government has long accused Al Jazeera, whose Qatari patrons are allies of the Brotherhood, of being a mouthpiece for the organization. The hotel occupants were “broadcasting news that threatens internal security and spreading false news,” the Interior Ministry said. Police said they also found literature that implicates the journalists for helping to organize recent protests that were illegal under a new law that sharply restricts public demonstrations. Al Jazeera English identified the reporters who were detained as correspondent Peter Greste, an Australian national; producers Mohamed Fadel Fahmy and Baher Mohamed, and cameraman Mohamed Fawzy. In a statement posted to its Web site, Al Jazeera demanded the immediate release of the journalists. Security forces have arrested hundreds of Muslim Brotherhood supporters in recent weeks as fresh demonstrations and an uptick in militant attacks have again reignited the battle between the Islamist movement and the state. The interim cabinet declared the group a terrorist organization last week following a deadly car bomb attack on a security building north of Cairo, for which the Sinai-based jihadist group Ansar Bayt al-Maqdis claimed responsibility. Government officials have since admitted they do not have direct evidence linking the Brotherhood, whose leaders are in jail, to the bombing. The terrorist designation has given rise to tensions ahead of a referendum on Egypt’s new constitution, planned for next month. Authorities had hoped the vote would advance the country’s transition to a new government and usher in a period of stability. In a report released Monday, the New York-based Committee to Protect Journalists, a press advocacy group, named Egypt one of the most dangerous places to work as a journalist in 2013. 3 days of fighting around Deir El-Zour airport has left numerous dead on both sides. According to latest reports, most of the fighting is near the pro-regime village of Jafra, control of which would put the Opposition fighters within a few hundred metres of the airport’s main gate. Other video on the Internet is showing a convoy of Islamist reinforcements on their way to join the battle to overrun the airport. According to information compiled by the Syrian Observatory for Human Rights in London, the Syrian regime’s barrel-bomb attacks on Aleppo since December 15th have now killed at least 517 people. including 151 children and 46 women. Some activist sources put the unconfirmed death toll even higher at 650. While the vast majority of those killed are civilians, at least 34 of the recorded deaths are of Opposition fighters, plus another 12 Jihadists. In the northern Aleppo countryside, regime aircraft are reported to have bombed the Bab Al-Hawa border crossing area twice in the last few days, HERE: The border crossing is currently controlled by Jihadists, but has been closed from the Turkish side by the authorities there. As many as 15 people have now died from hunger and dehydration in the Opposition-held Palestinian Refugee Camp of Yarmouk in southern Damascus. 5, including an elderly man, a woman and a disabled man, died over this last weekend, adding to an exist toll of 10 already dead (EDITOR: While a large part of the world feasted and celebrated Christmas). The Assad regime has not allowed food into the camp since September and long ago cut off the water supply, trying to use starvation as a weapon so that desperate residents will drive out Opposition fighters. The UN Relief and Works Agency for Palestinian refugees and several human rights groups have called on the Syrian Government to allow them to ferry in supplies, but to no avail. As well as the cold, the Palestinians are unable to shower because of the lack of water and now some are suffering from scabies. In the nearby similarly besieged suburb of Moadamiyah, a truce agreed with the Assad regime (scroll down – see earlier report below), finally allowed several trucks containing food to enter the district on Saturday afternoon. The trucks contained bread, sugar and basic canned foods, but according to activists the amount sent would normally only provide half a day’s supply for the estimated 8,000 fighters and residents still in the suburb. Qusai Zakarya, an activist inside Moadamiyah, said residents would continue to severely ration the canned goods as well as continue to eat plants to survive. He also insisted that they were not close to surrendering. More supplies may be allowed in through Government checkpoints in the coming days apparently if fighters give up some of their armoured vehicles. However, local people remain wary of the Assad regime’s intentions after soldiers failed to keep to their side of the bargain by trying to storm the town on Saturday, just a few hours before the food convoy arrived. In the Qalamoun region of Damascus province, the Syrian Government claims to have killed as many as 60 opposition fighters in a dawn ambush between the villages of Marah and Qustul and not far from the historic Christian town of Ma’aloula. Another 20 fighters were reported wounded. On Friday the Syrian Army pounded the eastern Damascus suburb of Douma with shells destroying residential building and also claimed that on Sunday it had evacuated 5,000 civilians from Adra, to the north-east of the capital. Heavy fighting between Government troops and Opposition fighters has been reported in and around Adra since December 11th. Government sources claimed that Jihadists had “massacred” Alawite civilians in the town, but this has not been verified. In Idlib province, Jihadists from the Islamic State of Iraq and Levant (ISIL) invaded several media facilities on Saturday evening in the Opposition-held town of Kafranbel, which has become with its banners one of the symbols of the anti-Assad uprising. ISIL targeted an Opposition radio station in the town and a media centre next door, confiscating or destroying computers, cameras, radio and Internet equipment and pro-uprising banners stored at the media centre. 6 media workers were at first detained but were released again after being held for 2 hours. The raid came just a short time after the radio station, Radio Fresh, broadcast a programme that featured interviews with several women discussing their personal lives and problems as divorcees. The Jihadists had also taken exception to political cartoons showing them stabbing the Free Syrian Army (FSA) “in the back” as it struggled to fight Assad. ISIL is also reported to have taken over a FSA weapons store in the town containing anti-aircraft guns, leaving the town vulnerable to Government air attacks. Negotiations are underway to get the weapons back. In Ma’arat Al-Numan, demonstrations in the town against ISIL, also led to the release of Lieutenant Colonel Ahmad Saoud, the leader of the FSA’s 13th Brigade, whom the Jihadists had “arrested” at the beginning of December. In London, a coroner’s inquest on the death of Dr. Abbas Khan, a British national who was found hanging in his cell in Damascus just days before his planned release (scroll down – see below), was opened and adjourned on Friday after police reports. A CT scan has has been carried out on the body and British doctors have completed a postmortem, but they are still waiting on toxology tests before an exact cause and time of death can be concluded. Dr. Khan’s body was released for burial last Thursday. Lastly, in what be an over-optimistic evaluation, an article at EAWorldView suggests that Hezbollah, with reported deaths of 300+ fighters in Syria, may have over-extended itself – We can but hope!